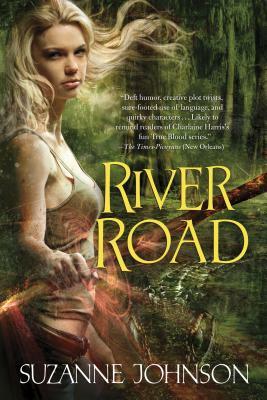 "River Road" by Suzanne Johnson is the fun, fast-paced second book in the Sentinels of New Orleans, a series of urban fantasy novels filled with wizards, mermen and pirates. These novels are perfect for readers of paranormal fiction and "fans of Charlaine Harris and Cat Adams" ("Booklist) "and "RT Bookreviews" agrees that "for readers missing Sookie Stackhouse, this series may be right up your alley." Hurricane Katrina is long gone, but the preternatural storm rages on in New Orleans. New species from the Beyond moved into Louisiana after the hurricane destroyed the borders between worlds, and it falls to wizard sentinel Drusilla Jaco and her partner, Alex Warin, to keep the preternaturals peaceful and the humans unaware. But a war is brewing between two clans of Cajun merpeople in Plaquemines Parish, and down in the swamp, DJ learns, there's more stirring than angry mermen and the threat of a were-gator. Wizards are dying, and something or someone from the Beyond is poisoning the waters of the mighty Mississippi, threatening the humans who live and work along the river. DJ and Alex must figure out what unearthly source is contaminating the water and who or what is killing the wizards. Is it a malcontented merman, the naughty nymph, or some other critter altogether? After all, DJ's undead suitor, the pirate Jean Lafitte, knows his way around a body or two. It's anything but smooth sailing on the bayou as the Sentinels of New Orleans series continues.